I was pretty skeptical. The instructions were to show up at the New York Psychoanalytic Institute at the designated time, to prepare nothing in advance, and then to sit in front of a public audience with half a dozen strangers and make interesting conversation for 90 minutes. Plus, our assigned topic was “The Mind of a Child”, something that I’m not all that familiar with (as my daughter never fails to remind me). This could turn out pretty miserably, and so I conveniently forgot to mention to anybody that the discussion was being live-streamed, and hoped that the first nice day of spring would draw the citizens of New York outdoors, keeping attendance low. The unstructured roundtable format turned out to work surprisingly well. It’s an idea worth stealing. And on reflection it’s a more extreme version of something that we’ve been exploring in other settings, as ways to get beyond the typical staleness of academic meetings. The event was organized by the Helix Center, the brainchild of Ed Nersessian and Rob Penzer. 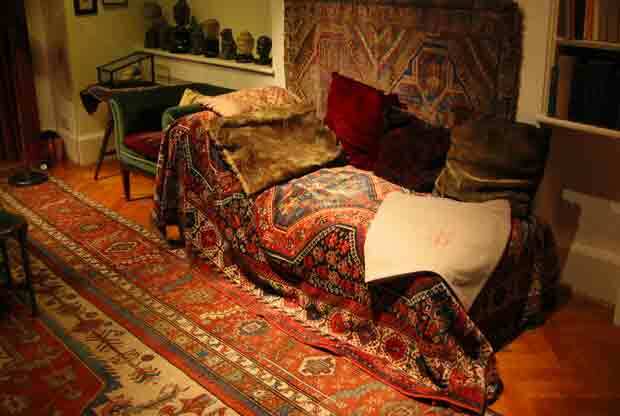 Ed is a psychoanalyst by training, hence the venue, but he has a very broad intellectual aesthetic. For the past 10 years or so the Helix Center and its previous incarnations have been bringing together people from very different backgrounds, trying to engage them in open-ended interdisciplinary discussion. The Helix Center’s motto is “An unhurried search for wisdom”, and is is quite deliberately pursuing a different path than the TED Talk model. The topics are very wide ranging, from psychology to metaphysics to genetics to animal cognition to genocide. My roundtable on “The Mind of a Child” featured two cognitive psychologists, two child psychoanalysts, a notable children’s book author and illustrator, and a hapless linguist. I suppose that language is really quite important to understanding how children’s experience of the world differs from our own, but I wouldn’t regard myself as an expert on child cognition. The unstructured format for the roundtable meant that nobody had a clue where the discussion would lead. Nobody knew when their contribution would be relevant. I had to pay very close attention all the time, carefully following the flow of the discussion, looking for opportunities to offer something relevant, and ready to offer something relevant if one of the other participants threw a question in my direction (“Hey language guy, what do we know about X?”). The discussion started on the topic of children’s stories, then moved through understanding of fact and fiction, early memories, infant experiments, and the relation between scientific findings and clinical practice, with some detours into pragmatics along the way. I was reminded of the improv sessions that Allyson Ettinger and Nina Hsu led during this year’s Winter Storm. Allyson and Nina showed us that improv is all about paying very close attention to the flow of the narrative. Back in January, the improv exercises were fun — and hard — but the application wasn’t clear. Now I could see it. This is all very different than our typical academic meeting, where contributions are more tightly planned. We give a rehearsed speech, hope that nothing much comes up in the brief question period, and then we can easily tune out for much of the rest of the meeting. Lots of talking happens, but not a lot of thinking on the spot. The unplanned format is quite different. You have to follow every word, and think on your feet. We’ve had similar experiences in the unstructured workshops that we ran in the past years, in Kiplin Hall and Tel Aviv. And I’ve often found that the most useful parts of classes come when the discussion pursues an unexpected direction. Did anything useful come of the discussion? I thought so. It highlighted the mismatch between the cognitive capacities of very young children and what they’re able to do in real-life situations. I got to think about the connection between experiments in the lab, where children face conveniently simplified scenarios, and children’s stories, which pull simple organized narratives out of the noise and confusion of life. I got to think about the relation between autobiographical memory — something that young children aren’t so great at — and the kind of very local memory access issues that we worry about in our research. The Helix Center posted a video of the roundtable online. Not sure that I’d recommend watching the whole thing. But a couple of minutes’ worth gives a sense of how the format worked. You have got to be kidding, Colin.